Level 3-mm is the seventh level of Fire Mountain in Mario vs. Donkey Kong. The high score for this level is 14000. The level opens with a cinematic showing Mario climbing a ladder as the Mini Marios move onto a conveyor belt, and Mario presses a blue Color Switch to create a platform at the end of the conveyor to prevent the Mini Marios from falling into spikes. The player first has to press a blue Color Switch to the left to create a bridge over a pit of lava. Then they have to climb a ladder and move right so the Mini Marios can collect the letter T. Next, the player has to use a Springboard and wait for the Mini Marios to jump up as well, followed by climbing up a ladder and pressing the yellow Color Switch. After moving beyond the yellow platforms and waiting for the Mini Marios to stand on the solid platform, the player has to press the red Color Switch and cross to the other side of the new platform, allowing the Mini Marios to collect the letter O. With the Mini Marios on the red platform, the player has to press the yellow Color Switch to have them drop to a new platform. 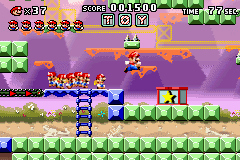 The player then has to drop and press the red Color Switch while the Mini Marios are standing on the yellow platform to have them fall and land on the conveyor below, allowing them to collect the letter Y. Now the player has to quickly climb a red ladder and press the blue Color Switch to create a platform leading to the toy box. Once the Mini Marios are collected in the toy box, the player will immediately move on to the next stage.